Webinars are an amazing tool to grow your authority, your relationships with your customers, and make some money! They are also a fantastic way to get to know your customers and their pain points – listen to them and they will tell you exactly what you should write in your sales copy! That’s why we created this Webinar Sign-Up Landing Page Template to get people to your webinar so you can reap all the rewards! Check out the video for more details and to see the template in action. Wondering what it looks like when you put it into a pretty page? 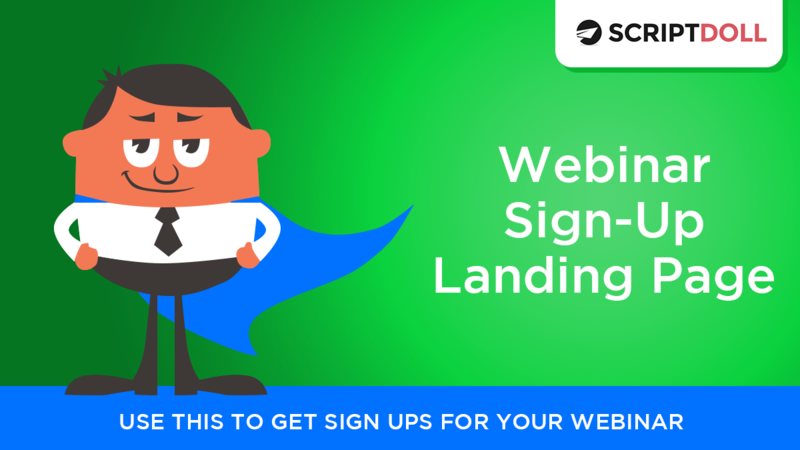 Check out our sample Webinar Sign-Up Landing page! This script makes a perfect companion to the The “Bill Gates Webinar Email Sequence” so that your webinars are super successful! And just to be even more sure, check out these handy numbers to make your webinar really shine. Don’t have ScriptDoll? No worries! You can try it for only $1 today! Hello, awesome human! Yes, I’m talking to you. You are an entrepreneur and you are changing the world. So I just wanted to say thank you for that before we get started with this new template. Today, we have the webinar signup landing page template. I am super excited about this. You guys have been asking for this for a little while. We just got it up for you. It is in the sales letter section of your scripts over here on the left and you can go ahead and click create this script. [00:00:30] I am going to use this ScriptDoll demo profile for this one. But again, remember you don’t have to use a profile if you check this button right here. Here we have the page, you guys. So this page is really awesome because it’s got a lot of little hints to make the person really want to come to your webinar. [00:01:00] It gives you a lot of credibility and builds your authority which is fantastic because if somebody’s coming to you for a webinar, you’re usually setting up to sell a higher price point item so we want to make sure we get that. So here, just a little subheader at the very top, join me on the date and time for this very special event. Then Monica, whatever your name is, if you want to use your business name, just change it here. How online marketer looking to simplify the copywriting process can write high converting sales letters using little effort in one hour. [00:01:30] So this is actually not too bad but I might say I might change this to you, just you, how you and then I just title case it, can write high converting sales letter using little effort in one hour. I can’t wait for you to discover how to and then you’re going to put your free teaching points in here. So webinars are free. This is a free webinar signup. So you’re going to teach them something and pitch at the end, right? [00:02:00] So put the three to five things, how many ever they are in here for what you’re teaching. So make sure that they’re good and descriptive and I’ve got a better example of this in just a little bit. I actually built this page for you guys to see an example of what it looks like from words to pretty graphics. So then you’re going to want to call out the date and time of the webinar and put some other time zones in there if you can. Then you want to start building your credibility with a photo of you and a little bit of information. [00:02:30] So in a free live call with Monica, I would actually change this for this experienced software developer and marketer. It would depend on how I’m positioning this. Like if I was not going to say I was presenting it from ScriptDoll, I would probably do that if I was pitching ScriptDoll on this call. So then we want nice big buttons and optionally a countdown timer. Then you want to give more credibility. You want to say what people have been saying about you, right? [00:03:00] So I’ve got some testimonials here and it’s from people that you may or may not know. But you’re also going to want to put pictures of them or videos if you guys have them. Videos are amazing because then you can really see them. Screenshots of Facebook posts are also awesome. Then we go on to you’ll want to experience this webinar, even if only to find out how to create persuasive sales messages in a matter of minutes. Yes, lock in my seat. Another button, a chance to click. Also, you will answer questions and and coach live for free. This is pretty much true of every webinar so put that in there. [00:03:30] Let people know. If they don’t come from an internet marketing background, they maybe not be used to this format of selling. So definitely give them all the benefits and then you’re going to want to give a lot more information about you. So put a bio and a picture of you in and then closing down with don’t miss this opportunity, definitely insert the countdown time. Then some scarcity with we only allow a certain number of registrations and spots for this call. So secure my free spot now. [00:04:00] Always have a button at the button because a lot of people just like scroll to the very bottom to look for the button to sign up and if they can’t find it easily, but then there’s this little extra that’s like, “Hey, by the way, you’re going to get on our mailing list.” So this is fun and you could download it in any format you want. I created a page over here to show you how this would look. So I call this the shut up and take my money webinar. It’s a webinar that I am making up and if enough people sign up for it, I’ll give it. But it’s a made up webinar just to show you guys how this could work. [00:04:30] But how you can find the exact words to use to make your customers say, “Shut up and take my money,” and I just this GIF in here because it’s fun. You could see I’ve got my little subheader at the top and then I’ve got ScriptDoll presents. I want this to be small because I really want them to be able to see down the page so you guys can see how you can and then this text here would come out of your profile or you can just make it up so that’s the top of this, right, how you can do something. [00:05:00] I actually do use the one hour a little bit later in here. So this is the beauty of ScriptDoll, you guys, is that really you just want to get these elements on the page. So you could say this is a little different. I’ve got the date and time and I put all of the times here. Then I’ve got some scarcity here which is not in the script but it was in the template so I went for it. Then here’s my little tiny, tiny bio and then these are the three things I’m teaching. [00:05:30] How to find nodding words, these are the words that make your customers’ head nod along in agreement as they read your sales letters, emails and VSLs. How to use the nodding words, right, to make your audience feel like you know them so they say, “Shut up and take my money.” And how to do it all in two hours. So the webinar won’t be two hours but how to do this in two hours. That’s actually kind of a little misleading. I would probably change that, now that I’m reading it out loud, which by the way, you guys, is a great, great, great tactic for your sales copy. [00:06:00] Read it out loud. Make sure it sounds good. You’re going to find mistakes like I just did live on this video and fixed them when you do it. So not everybody shoots a video but it’s not a bad idea. Then another button, yes, reserve my spot. A countdown timer, right? Following this script here, right? There’s this, reserve my spot. Now, we’re going to get into what others have been saying. So what others have been saying about Monica and ScriptDoll. [00:06:30] I’ve got a testimonial video from Zach. I’ve got this great Facebook screenshot, one from Sammy and then one from Drew. This one’s great because he’s so nicely liked to this and I’ve got more ScriptDoll branding on this page which is fantastic. There’s also other people commenting down in here, that’s why I sort of love Facebook comments as well because you can dig into those and people say other lovely things. [00:07:30] This is also a great technique for networking in general. If you go find some information on somebody, hopefully they have been kind enough to provide you with this information because I love to talk about food. So anybody that comes up to me to talk about food is A-okay in my book. So dig for somebody’s extra little info that you can use to meet them one day. Anyway, this is just a side note. It has nothing to do with the template except that you’re going to want to give people that so that if they want to meet you in person then they have more to talk to you about, or even online like if they want to open an email conversation with you, [00:08:00] it’s a great way for them to start and if you do this, you can also use our cold intro email templates, just a side note. Okay, so again, secure my free spot. I want the button at the bottom. Don’t miss this opportunity. Another countdown. We only have two spots and as a bonus you’ll be registering. Then for this, register your free spot now. I’m going to go ahead and type this and secure my spot. [00:08:30] I just wanted to show you guys the thank you page. It says ScriptDoll. Great, you are successfully registered and confirmed for this webinar. I actually don’t have a webinar set up. This is just an example to show you guys so the countdown timer isn’t working because I don’t have this button triggered. I’ve got Ben’s picture. Again, you guys, this is another great reason to read your sales stuff out loud. So for those of you that don’t, Dr. Ben Adkins is my business partner in ScriptDoll. He is an amazing man. So this is a great example of a way that this script over here can come from words, real life, there you go, there you have it. [00:09:00] You guys, use this webinar signup script to get people to come to your webinars. Also you guys, you can use the Bill Gates webinar promo. If you already have a list and you want to get them on it, it’s also got some great followup emails for the webinars so you can use that in combination and if you’ve got a profile filled out, it works hand in hand with the webinar sign up script. So Bill Gates webinar promo and the webinar signup script. [00:09:30] Get your webinar going and make a ton of sales and make your customers happy. Thanks for being a ScriptDoll user. If you’re not a ScriptDoll user, please look below to find out you can become one.